My Thanks to Stephen Wilde, who has submitted this article containing a hypothesis on energy flow in Earth’s climate system. An attempt is made to reconcile the diabatic and adiabatic processes within a planetary atmosphere and in doing so show how changes in the radiative characteristics of constituent molecules in an atmosphere might not have an effect on the equilibrium temperature of the atmosphere and of the surface beneath it. Essentially, the adiabatic and diabatic processes must always match each other on any given planet at equilibrium because they are then of equal size and run at equal speed but are of opposite sign. The diabatic process results in warming and the adiabatic process rations the supply of PE in the atmosphere flowing back to the surface in the form of KE thereby maintaining the equilibrium temperature set by mass, gravity and insolation. the other process changes its own speed to restore equilibrium. in both processes by the same amount. KE + PE = constant. The established science is that only mass, gravity and insolation can change that constant so if radiative characteristics of GHGs in the diabatic process cause a rise or fall in the atmospheric height then that must be at the expense of either KE (if rising) or PE (if falling) because the constant does not change. So, the thermal effect of a rise in the atmospheric height must be negated by a fall in KE as KE gets replaced by PE and for a fall in the atmospheric height there would be an increase in KE relative to PE. The net thermal effect being zero. adiabatic stabilisation) also works for the early faint sun paradox. thus diluting the effect of the increase in solar power. The atmospheric mass might actually have declined, partially offsetting the increase in solar power. any given height which sets temperature and not DWIR and UWIR. but being of opposite sign as regards their thermal responses to the same forcing element and both being independently capable of variation they keep each other in check. If the effective radiating height for DWIR/UWIR changes in the diabatic loop then there is an equal change in the height of KE/PE equilibrium in the adiabatic loop but although each changes height the thermal effects are opposite. at the expense of KE. gravity and insolation but that would be inconsistent with the Venus comparison and with established science wouldn’t it? Apples are oranges. This might make some sense in certain ways like if you have to carry a load of apples to market then use the same truck and crates to carry some oranges tomorrow, adjusting the quantity slightly. The grocer might even use the same display case adjusting the price slightly. Oh man, I’ve gotta’ go search some more strawmen to stab…. No, I’m not talking phase changes, they occur within the control volume. The mathematics and 15 yrs. 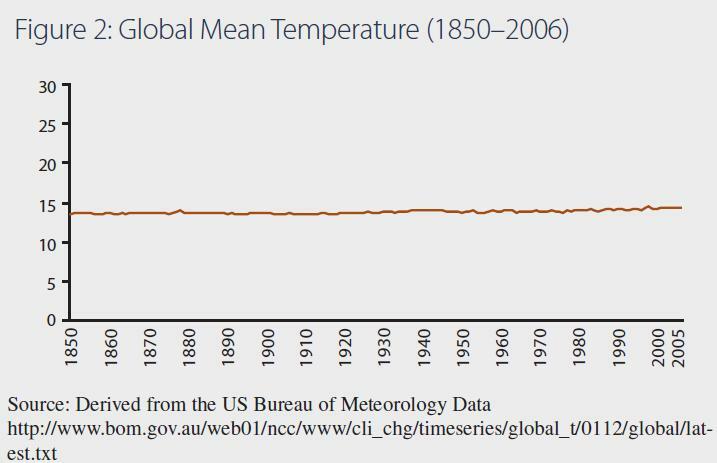 or so of modern science tell us the energy in the troposphere is unchanged as it is not net warmed by infrared active gas additions; add the stratosphere and the total atm. energy is unchanged due to internal processes. The only way to warm the total atm. is to get more net energy in from the sun (net of albedo changes). Or of course increase the 0.1 W/m^2 from geotherms. You were referring to expansion and contraction of one half at a time not of the entire atmosphere. In relation to that one half the solar input changes from zero to full on which is what causes the expansion and contraction and the movement of PE and KE in and out of storage on that one side. Therefore T and V are both affected above that one half on a diurnal basis. My comment about the effect of radiative changes from composition of the atmopsphere wasn’t quite right. In that case the total of PE and KE does change but because the total energy coming in from outside does not change then all of any thermal effect from radiative characteristics could only go to V and more PE which would then result in a change of heights and the adiabatic loop would adjust for the discrepancy between PE and KE so as to restore the 50/50 ratio. However I am doubtful that the radiative changes have any net effect anyway because they don’t in themselves seem to cause any volume changes. I just say that if they could have such an effect then the system must correct for it in the same was as it does when other internal forcing elements try to upset top of atmosphere balance. The volume changes I know of come from the effect of water vapour in the troposphere altering the lapse rate and thus the height of the tropopause and the effect of direct solar heating of ozone affecting the volume of the stratosphere so much that the lapse rate actually reverses. One thing Trick has got right is that the only way to warm the total atmosphere is to increase the energy supply from outside. What he doesn’t seem to realise is that I am describing the process that retains system stability when ANY internal forcing element seeks to disturb equilibrium. If radiative changes have any net effect then the same adjustment method would apply. That internal adjustment can only involve V and an element on the other side of my equation because T being inversely related to V cannot rise unless V falls so if V rises then T cannot. With P being fixed for an atmosphere as a whole and no increase in mass, gravity or insolation there are no variables left other than T and V on one side of the equation and the PE/KE relationship on the other side. You actually claim to be responding to a strawman argument while offering one??? Where exactly do I claim energy is being created in the “control volume of the earth/atm”? “All the natural processes I’ve ever seen follow: T*dS greater than delta Q. Bar none. I’ve learned about these natural processes from natural thought experiments w/pictures of processes following: T*dS equal delta Q but none of these exist in the wild. If they did, my furnace wouldn’t run as much, if at all when 255K outside. 1) Would un-emit mean absorb? 2) Would objects emitted from an Emitter that come within range of the Unemitter instantly disappear? 3) If we un-emitted attention, what would happen to a blog? To Politicians? 4) Can you stimulate when things un-emit like the opposite of a LASER? A LASUER pointer that takes a dark round spot of light OFF the presentation? Or is un-emitting only ever spontaneous? 1. Absorbing a different photon is not the same as reversing emission of the original one. 2. Perhaps, it would be a dangerous thing to be around I imagine. 3. I’d love if we could calibrate this to the wavelengths which politicians feed on, but I think we need to determine the force carrier involved in attentive transfers. 4. The world may never know. More seriously, there are more possible states for a system that has emitted radiation to be in, so the disorder is greater. I’m used to seeing it as S = dQ/T or dS=dQ/T, but if radiation didn’t carry entropy out of the system you should be able to make an arbitrarily efficient heat engine. Radiative gases play a far bigger role in cooling the atmosphere than they can in heating it. How much outgoing IR do they intercept from the surface? A small amount. How much IR do they radiate to space? A far greater amount than they intercept from the surface. And albedo. And other T influential cycles (orbits et.al.). I am on Stephen’s side here when folks talk about say 15 years of not much global near surface Tavg. change. Much longer than that since the beginning of (somewhat shabby) thermometer station readings, I am not so sure. Interestingly the modern day science and math has been out about 15 years or so too. Maybe nature took note & read up on the modern science and corrected her ways? Nahhh….bad Trick, bad, BAD Trick. It is not nice to fool with Mother Nature. Yes, it is windy near earth surface; few limbs blew off an evergreen few nights ago. Compensating for CO2 near surface T effects as they fell to the ground. I will burn them next summer at the 4th of July all-lake firework & bonfire party, returning the carbon to the atm. from whence it came. To begin the cycle anew. The key word is internal. No internal process adds energy to the earth/atm system unless energy is created internally and there is no hope for that (well, unless e=mc^2 is used). Internal stuff keeps it all well mixed, fortunately. What big time keeps the stability is the external stuff: stable sun and the ability of the earth system to reject the sun stably. This is really remarkable, a reason we are all here to blog -incessantly. Some day of course this will end. Hopefully humans find a near enough earth like planet, or they find us first. Takes energy to increase mass’ speed, an acceleration. F=ma, energy = F*d. QED, Konrad creates energy in control volume. This would increase surface ability to radiate to conserve energy; if reduce internal ability to radiate, must show increase internal ability to radiate elsewhere or energy then created internally. Nice but no cigar. In=out. Always. Well, except for a little bit of variability evidenced each month’s report of global near surface Tavg. Kinda’. Have to watch the d’s. The left side is a true differential but thermo just can’t live with a true differential on the RHS, so it uses historically a delta sign, a bit different in meaning, the delta Q is a small quantity but not generally so small as to be a true differential. Check it out in your thermo texts. You will see. Thermo actually expects us to believe not only that one differential can be bigger than another, but even that a differential can be bigger than something which is not a differential. Thermo is a really twisted science. Perfect for blogs. How many blogs do you see dissing beam theory? Any? Yet jet aircraft engines don’t melt, it is sort of hilarious – just the batteries do. Hey put the jet engine thermo guys on to the battery team, duh Boeing? I am on a momentary roll. Think of the universe. The ultimate closed system, all internal processes so far as we know, no energy enters, none created. The entropy can’t be forced down, is relentless in increase. The universe radiation energy becomes less and less useful as its entropy (disorder) increases. Heat death eventually, all entropy no useful energy. Black holes evaporated back all the information they ever sucked in, no information lost at all. Entropy is cool. No hope to go against it. •	Nikolov and Zeller’s integration of the mean temperatures are correct. I’ve checked their integral derivations and numerically integrated two completely different geometric ways – it is 154.3 K using the moon’s albedo and emissivity per the Diviner mission. •	Diviner mission – it is also correct. The moon is much colder than historically thought and just like the Earth minus an atmosphere it is warmer that the “super conducting” case (Dr. Robert Brown’s terming) of a surface with zero thermal inertia and mass. That brings the dry and barren bodies up to over 200 K by itself, about 212 K if I remember correct. Energy stored below a physical surface or not within a gas can never radiate. •	The Earth is not as AGW science explains that you have an evenly warmed and cooled 240 w/m2 of input to anywhere on the surface. Closer, diurnal, you have a mean 480 w/m2 of input on the day side and zero input on the night side. If the night does not come close to shedding a rate of 240 w/m2 all night long, then there will be a boost in the mean temperature at equilibrium just as seen from the surface thermal inertia. And yes Trick, input equals output over the long haul. •	You still have to account for the approximate 76 K to raise the mean Earth from ~212 K to ~288 K and I have yet to find anyone able to come close to explaining how this huge amount of resident energy stays resident within our atmospheric system, day in and day out. It is not from a concentration of 0.00039 of co2 or even the 1.5% of water vapor for sure. Daytime expansion carried along with the atmosphere onto the night side to shrink back down and compress to maintain warmth in the air could very well be the answer looked for, the basic equations agree. Energy stored as gravitational potential energy can never ‘radiate’ away. Ok Stephen, I tried to hand it to you freely. Maybe best I keep it myself and run with it. Closest I’ve ever come to something worth writing a science paper for the last forty years. No kidding. But this will take a while to firm the numbers, equations and find the supporting data. Who knows, I might be able to disprove this thought myself. It also answers a slew of questions that radiation-only has no answer for at all. Mars is dry and barren, at about Teq.=210K, with little GHE ~few K to 212-215K. Is that a coincidence or a clue? The reason I say you can’t “put the genie back in” with photons is because you can’t collect all of the emissions and restore it to the original surface. You can’t win, you can’t break even, and you can’t stop playing. 1- You still don’t seem to be grasping the mechanics of fluids in a gravity field. Do this little experiment and you may get close to understanding the role of radiative gases in our atmosphere. – get a large glass container of hot water and mix a ¼ teaspoon of finely ground cinnamon into it. – wait until Brownian motion slows till the suspended particles are barely moving. You just created vertical convective circulation by removing energy from a fluid! Impossible! 2- In=out. Always? No, again you are wrong. Remove radiative gases and our atmosphere will begin to heat. Energy In will not equal energy out of the atmosphere while the atmosphere is heating. Only when the atmosphere has heated to a temperature far hotter than current will a new equilibrium be reached and energy entering the atmosphere will again equal energy exiting the atmosphere. Just like the original two box experiment. Without radiative gases our atmosphere will run hotter. The AGW hypothesis is the worst mistake in the history of human scientific endeavour. So if anything within the system other than mass gravity or insolation tries to alter T there has to be an internal system mechanism which changes to once again arrange that outgoing radiation matches incoming radiation. In the process that mechanism must raise T or reduce T as necessary (or prevent T from changing in the first place) to maintain top of atmosphere balance over time subject to variations around the mean. I have provided a suitable explanation whatever may be the problems translating that into formal equations or getting the minds of others to grasp the concept. The fact is that there is a stabilising mechanism and the equations must be made to reflect the reality. I appreciate your efforts wayne. That unaccounted for energy store is PE locked into my adiabatic loop in a constant cycle of decompression and compression. Nothing else works. We need variability within that loop to counter radiative imbalances at top opf atmosphere which arise from internal variations including the radiative characteristics of constituent molecules. Trick has agreed some important points but just cannot seem to make the final conceptual leap because his mind is set on his radiative only calculations. You can see the concept but are having difficulty accepting the basic simplicity of my suggested equation. In reality the Earth’s rotation spreads the cells of compression and decompression all around the globe even though the basic scenario is daytime decompression and night time compression. Yes, ‘the ability of the Earth system to reject the sun stably’, well put,and the adiabatic loop varies to provide that ability and achieve the outcome by expanding, contracting and keeping the KE/PE ratio stable along the vertical pressure gradient despite internal system variations such as radiative characteristics of constituent molecules ocean cycles, solar effects on the composition of the upper atmosphere and all other internal variations. The system response to internal variability is always, fast, complete and inevitably negative because the atmosphere MUST ALWAYS match energy in with energy out subject to variations around the mean whilst the equilibrium process is ongoing (which is all the time). Trick shows that the radiative equations work but they only do so because they implicitly incorporate the net effect of that non radiative regulating process. Several times Trick came up with numbers that seemed to reflect the stable reality but then he failed to realise that it is a non radiative process operating in the background that enabled his radiative calculations to be squared off. I think that is pretty near to agreement between the three of us is it not ? Stephen 8:50am: You would have a case if infrared active gases realized when they absorbed IR coming up from below they were supposed to emit the IR in same up direction IR was previously traveling. The effects balancing as you describe. But this is not the case, they emit in random directions changing the direction of some of the upcoming IR photons into a bath. The complex modern math shows this effect in earth atm. is stronger than you imagine and results in some constant internal IR energy permanently below ~600mb and same amount less just as permanently above ~600mb, still in external radiative LTE balance for eons. We humans feel the effect by comfortably wearing thinner coats in the winter, running our furnaces less than if this absorb/emit IR complex bath physics was not happening. Nothing in Konrad’s cinnamon/beer can/ice water bath contraption can change these physics. I suppose at least Konrad got some human wants/needs fulfilled from the experiment by emptying the beer can. You say radiative, I say adiabatic. Close, well, the cells are carried along with the rotating atmosphere. Spreading implies a lateral movement across the ground. Those ‘adiabatic’ cells die every night. One factor I am injecting in your thoughts is that during the day you have strong vertical velocity that is KE *within* your loops, air rising *and* descending, and that vertical velocity dies away and slows to zero, vertically, during every night. Sailplanes have no ‘engine’ at night. What happens to that vertical KE? Does it become a change in ‘T’? I don’t see that KE merely becoming PE meaning it is a transfer to ‘T’. How much roughly? By what equations? Don’t leave it out. When you put the numbers to it, I already have, it is a sizable vertical transfer to ‘T’ right there, not counting any water vapor and state change that is yet another quanta of energy transfer you need to put in equations if you are to prove your idea. You seem to be fighting me and I am trying to help you prove your idea correct. Be brave, if the equations end up disproving your idea, I’ll have to follow the physics, but I think that is not going to happen, you seem to have something there and I can see it too. Lets break these circular arguments and move on to proving it. If you will accept my help and take ‘area’ into account you will see the strange effects to ‘T’ that manifests in the energy at the top and bottom of these ‘adiabatic’ loops, basically heat pipes. The strangeness comes when you try to respect the conservation of mass vertically along with the velocities of the up and down portions that do have different areas, also, always respecting the conservation of energy and momentum. P x V is energy and the product of the two are in units of Joules that you can equate into the ½∙m∙v² or equivalently p²/2m of the cycling vertical air mass. Just saying ‘adiabatic’ (no transfer of energy) loop you are describing a movement up and down that respects the potential temperature equation (or a modification to Poisson’s in Cp), cooling as it rises and warming as it descends but by that equation and the adiabatic process you have vertical symmetry in the energy and nothing happens with that energy at all. Is that what you see? No energy change at all? You need to change your insistence on saying ‘adiabatic loop’ a hundred times. You might consider renaming it a bit so it matches what you are trying to get other people to visualize. Of, relating to, or being a reversible thermodynamic process that occurs without gain or loss of heat and without a change in entropy. Does that accurately describe your ‘adiabatic loop’ in the atmosphere to you? That’s not the way I keep reading you trying to describe it. You keep implying energy transfer and it get confusing. “- get a large glass container of hot water and mix a ¼ teaspoon of finely ground cinnamon into it. Trick, you keep getting the basic physics of convection spectacularly wrong. You claimed I needed to add energy to drive convection. I gave you an empirical experiment showing how to drive convection by removing energy from a fluid. Will you admit that you got the basic physics of convection wrong? wayne, my comment was addressed to Trick rather than you. As regards the concept of an adiabatic loop I described it at some length in the head post. In effect the entire atmosphere is comprised of rising and falling air at every level though most obviously in the troposphere. At any given moment half the atmosphere is rising and half is falling. No energy is gained or lost and it is fully reversible. A constant cycle of compression and decompression and the energy locked into it is what gives rise to the atmosphere appearing to be warmer than it ‘should’ be from applying the S-B equation. Trick and the AGW proponents all think that the cause of the ‘extra’ warmth is radiative. I think it is adiabatic. Radiation is a consequence of temperature and not a cause of temperature. Oops, didn’t mean to interrupt! 😉 Carry on. while conducting the simple experiment to show just how wrong Trick was about needing to add energy to drive convection (I guess Trick is off having a long drawn out wince) I saw something interesting. Not only do the suspended particles show the convective circulation, they also show turbulence and mixing in fine detail. Think of a pot of water on the stove. Turn the gas up and the water will increase in temperature. Turn the gas up further and the water will reach 100C and boil. Turn the gas up further and the water will remain at 100C but will boil away faster. Think about an atmosphere without radiative gases. Add CO2 and convection starts and the atmosphere begins to cool. Add more CO2 and the near surface temperature drops to around 15C av. Add more CO2 and the temperature remains at around 15C av. Yet convection runs faster. This would indicate that for an atmosphere that has more than sufficient radiative gases to drive convection, the only way left to change temperatures would be changes in solar radiation or surface pressure. It should be noted that all planets and moons in our atmosphere have radiative gases. This may be why the N&Z hypothesis holds true for all. * set by surface pressure and solar insolation. Correction for above -all planets and moons with atmospheres in our solar system have radiative gases…. Thanks for your further thoughts. The pot of boiling water analogy is one that I often use. The boiling point is set by pressure so if more energy is added it simply boils faster. I often refer to the lower boiling point at the top of Everest too and my point about air pressure on the oceans acting as another thermostatic mechanism is one that tallbloke was thinking about as well. My contention is that the basic lapse rate and atmospheric height is set by gravity and insolation acting on mass, nothing else, but that assumes a radiatively inert atmosphere. That is the basic contention of N & Z and various others. I thought that was once the settled science. There is no such thing as a radiatively inert atmosphere even with O2 and N because ALL mass has SOME radiative capability. If one then increases radiative capability then maybe that does have a net warming or net cooling effect but either way that cannot alter equilibrium temperature. It just affects the rate at which energy flows through exactly as per the boiling pot analogy. It is like adding other materials to the boiling water that absorbs energy from the heat source faster or more effectively than does the water itself. The boiling point stays the same but the rate of boiling can change. The volume of the water tries to change too does it not ? Actually that extension to the boiling pot analogy is very apt because those additional materials would behave in exactly the same way as adding additional characterisatics to molecules in the air. I suggest the adiabatic loop as the countering mechanism which varies in speed just as does the rate of boiling when a pot of water tries to go above 100C. It is the pressure gradient set by gravity that ‘tells’ every molecule the height at which it should sit for its own specific physical characteristics and energy content. If it finds itself out of place it just moves up or down until it is again at the right height relative to the pressure gradient. That works just fine for individual molecules or parcels of air within an atmosphere and the IGL applies. It doesn’t work for an entire atmosphere because then pressure is fixed and one cannot move the entire atmosphere up or down relative to the gravitational field unless one were to lift it bodily away from the surface all around the globe. When pressure is fixed the only remaining variables are V and PE because E (PE+KE) is fixed by insolation and the half which is in KE form is the same as T on the other side of the equation so KE and T cancel out. The only variables left if mass (n) gravity (R), pressure (P) and KE stay the same is PE and V so inevitably any change in V can only go to PE and not KE. As David Socrates realised there is only a fixed fund of KE if mass gravity and insolation stay the same and it comprises only half of the energy required to maintain atmospheric height. The other half being PE. All necessary adjustments to maintain top of atmosphere radiative balance can therefore only be achieved by juggling V and PE. So I do think we are both right if you agree that the temperature decline with height is due to the pressure gradient allowing PE to replace KE as one goes up. The column always contains the same energy at every level from bottom to top but as one goes up the temperature falls as KE declines relative to PE. Where we still seem to disagree is that even in a radiatively inert atmosphere that pressure gradient and the consequent KE decline with height will still induce convective overturning via an adiabatic loop. You know, I get a headache when I am asked to prove such an obvious proposition with data and observations. All one needs to do for verification is consider a pot of boiling water and the addition of thermally active impurities. The boiling point stays the same but the rate of boiling can change. The atmosphere being a fluid subjected to pressure is exactly the same but the rate of conversion of water to vapour in the process of boiling is for the atmosphere the rate of conversion of KE to outgoing longwave radiation which then varies V and PE as necessary to match incoming solar energy. No further proof should be required. Don’t know how that happened. That will do it too! See non-constant external energy flow is all you need. The atm. IR active gases neither create NOR destroy internal energy. They are internal! Can’t speed up or slow down things inside since don’t cross the crontrol volume, that’s why control volumes are so powerful. Now your beer is absorbed internal too. Soon it will be emitted. Stephen’s adiabatic loop is a useful construct to learn this; helps me communicate with Stephen. Konrad – your experiments exactly follow the laws of nature. So does the atm. There is nothing you can experiment with to find the laws are inaccurate. Just your interpretations. I am interested to help understand the experimental physics but you create so many external energy fluxes w/o measuring a one, this help is impossible. (refrigerator electric cord, fan electronics, fan motor, fan blades working the air, cling wrap UV, house furnace, house insulation, box insulation, et. al.). If you measure the fluxes one & all reasonably well & use control volumes to account for energy flux, understanding will come to Konrad. Just like understanding came to the cold fusion experiments, the laws of nature won. Konrad – Here’s your experimental target. Slow down a mass or speed up a mass using constant energy in the control volume, no force crosses the control volume, no energy crosses in/out the control volume, yet the experiment shows the internal mass changes velocity. That will get my attention. You can use cinnamon & beer if you want. It is alleged that GHGs slow down energy transmission. That means that the supply of energy to the non radiative processes ceases to be constant so the constancy parameter that Trick imposes is not appropriate. The energy supply to the system from outside remains constant but the GHGs have intoduced a variation in the rate of energy supply within the system. If they do then the system response is to speed up energy transmission elsewhere in order to equalise top of atmosphere balance again with no necessary change in overall system temperature. Thus no need for any force to cross the control volume at top of amosphere or any energy to cross in/out of the control volume at top of atmosphere. You simply have two control volumes within the atmosphere that cancel out. But it is not demonstrated that GHGs do cause a slowdown in the first place. If Trick avers that GHGs have no effect on the speed of energy transmission through the system then that is fine by me since there is then no need for an equal and opposite system response either. Yeah Stephen, the variation in constant energy supply manifests little more energy below ~600mb and same amt. little less above ~600mb due IR active gas up to tropopause whereafter other processes dominate to p=0 (no longer a smooth lapse curve). T slightly higher on avg. below ~600mb, T slightly lower above ~600mb on avg. by same amount energy; atm. computes itself a crossover point in troposphere. Our job is try and understand where/why the crossover. Once accomplish that, can better understand why it changes consistent with natural laws. IR active gas doesn’t add net energy, just moves constant energy from ~LTE external flows around inside control volume, like a redirection of a hockey puck is useful when on target. This is why the debate about surface “net heating” fails w/o insolation or albedo and near surface “slowing of cooling” is ok with constant energy b/c no net heating, there is “slowing of T increase” somewhere else in the control volume. Unless of course insolation increases net of albedo changes or albedo changes net of insolation changes which increase or decrease energy in the control volume able to drive change in speed of the adiabatic processes. Given very constant mass and gravity. This is hard for me to write accurately but I can learn the eqn. form is not so easy to understand and stick for some. Bigger temperature differential leads to faster convection in the adiabatic loop. another big (F-). SEE ME AFTER CLASS! At least you are now admitting you were wrong in your original assertion that added energy was needed to speed convective flow. But you clearly do not understand the basic physics of convection in fluids. Understanding convection is critical to understanding why AGW is physically impossible. That is just Bafflegab designed to cause doubt in others reading this as to nature of the simple repeatable empirical experiments I have presented here. It won’t work. Oh, and the “cold fusion” analogy is not going to work out, after all the “maxwells demon” smear failed. 1. Adding radiative gases to the atmosphere will not reduce the atmospheres radiative cooling ability. 2. Radiative gases cause cooling at all concentrations above 0ppm. 3. AGW is physically impossible. Trick, history can’t be rewritten on AGW in the age of the Internet. The AGW pseudo scientists got it wrong. They did not correctly model the atmosphere with depth, gravity and moving gases. In the near future as the painful back down occurs there will be a lot of fancy excuses, a lot of bafflegab that sounds “sciency” as to why they got it wrong. But the basic truth, “they forgot gravity” will remain on display forever. Yes, I believe the atmosphere would have reached the “reverse boiling point” at far lower concentrations of radiative gases. Adding more is unlikely to resulting in any further measurable cooling. Convection may speed up slightly but this too would be unmeasurable as 0.04% CO2 is too low to make a difference to anything. H2O does all the work, and the atmosphere already has more than enough to run an effective vapour/condensate heat pump. The only way now for global temperatures to change would be to alter surface pressures or alter the amount of solar radiation reaching the surface. Gravity is a force field Konrad! Coming in across the control volume too like your refrig. electric cord. You need to properly account for it and when you do so, you will find gravity can move the constant energy around, even in an atm. fluid & more fully understand your uncontrolled box fluids. Causing we humans not need to wear as thick a coat outside in the winter or even run our furnaces as long. Check it out, very interesting. Konrad wants me to believe the author of “Principles of Planetary Climate” author leaves out considering the fact that hot air rises. QED “Principles of Planetary Climate” does not fail to include the physical fact that hot air rises in a planetary atm. Konrad should pick up a copy so as at least to find how I didn’t clip these out of book context (rather than print the whole book for Konrad but tb did say it is on-line somewhere IIRC). So Pierrehumbert clearly explains, hidden in his words (sneaky devil), that radiation, the net ~63 w/m2, is all that radiation does at the surface and that wind friction, evaporation, conduction and convection are all that is happening there, in a mean sense, at the surface. The ~63 w/m2 of radiation goes to space as radiative window energy or a small portion may smear across the mix of energy (temperature) in the mid-troposphere. Now we are getting somewhere Trick. Internal to the troposphere it is all ruled by thermodynamics until you approach the tropopause. So far, so good. Now forget the lower troposphere and we can now concentrate on what occurs up there. I agree with Konrad, it is all water vapor there but a very tiny amount from co2, and even there, you cannot “trap energy” by an isolated 0.04% of co2 molecules where equipartition across all available states guarantees it is going to escape to space one way or the other, the other being mainly by h2o radiation lines and continuum. It is strictly a matter of temperature and density. There you cannot ignore density in the SB relation for it is no longer a solid surface but a diffuse gas and density of the molecules radiating does matter. If co2’s ‘bite’ ever does increase in the wings, equipartition means h2o lines of radiance will increase to compensate (or in O3 or CH4 or … lines). Qantas of energy do not have “membership” or “ownership” labels attached to them saying “I belong to a c02 line”! That is why the OLR does not follow the concentration of co2 curve, not at all. Surely you have seen that in the data. I certainly hope you did not pay for that book. When I said “Names like “Pierrehumbert” spring to mind. (I think he wrote “The farming of spherical chickens in a vacuum – for beginners.” I was joking. “Spherical chickens in a vacuum” is an ancient physics joke and so is Pierrehumbert. I was using Pierrehumbert as a classic example of what is wrong with AGW physics. I will admit to never owning his text, but I was alerted to the bafflegab contained therin by a die hard AGW believer Joel Shore. Joel was unable to comprehend the role of radiative gases in cooling the atmosphere. He could not understand that the ability of CO2 to warm by intercepting IR from the surface was an inverse logarithmic function of its concentration in the atmosphere. While the ability of CO2 to radiate energy to space that the atmosphere had acquired from latent heat and surface conduction was a linear function of its concentration in the atmosphere. Pierrehumberts text was his bible. I maintain that they have not properly considered or modelled this fact. What is the corollary of “Hot air rises”? Cool air descends! How does it cool (lose energy and buoyancy) at altitude in our atmosphere? Radiative gases. Pierrehumbert could best be described as an academic activist. Scientist does not fit. He has been one of those maintaining the consensus position of an atmosphere 33C cooler than present without radiative gases. Pierrehumbert is a linear flux guy. Search his text all you like but you will not find an accurate modelling of the critical role of radiative gases in convective circulation below the troposphere.